Jailen Gill, 6’7”, 225 transferred to Antelope Valley College from Coffeyville Community College in Kansas where he started 20 games as their post player. Jailen’s stats last year were 6’5” ppg and 6.3” rpg last year. Gill graduated from Raytown High School, Raytown, Missouri in 2015. Jailen decided to head to California and wanted to play a top JUCO program. Working with Assistant Coach Davis he decided AVC was for him. Jailen see’s himself as a strong presence at the power forward position and enjoys the the physicality of the rebounding part of the game. He sees his game improving dramatically being paired with 6’10”, 265 Anton “Ace” Warren dominating the post. His goals including a state JUCO title, solid grades and to play university basketball in the future. Jailen has had limited workout or playing time at the JUCO Shootout last weekend as he is nursing a quadriceps injury. Watch out when this man gets healthy. The “No Chrome” AVC Jailen Gill has had a heck of a Fall. As I predicted, after he got healthy and added conditioning/strength on the track and weigh room, he has become a beast. Dominating the paint along with four additional big strong paint powers, he still is quiet and effective at his power forward position. There are main improvements that jump out at you when you watch the well conditioned and healthy Gill, the explosiveness around the basket and his consistent mid-ranged shooting. Add to that his excellent footwork and ball-handling, he will be a beast for the opponents to handle. With all of the D-1 interest that Jailen Gill has received, he says that he has really turned up his attention on academics. 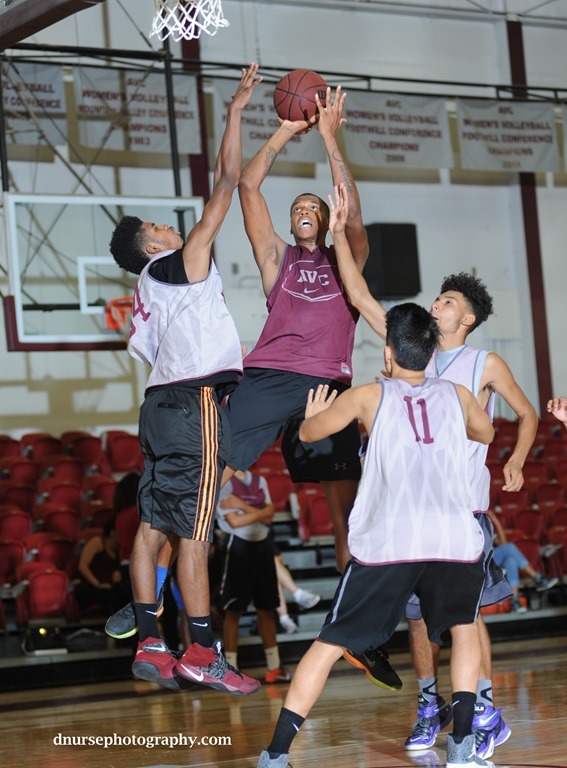 Just one warning to the fans when they watch the AVC games, be careful not to overlook Jailen Gill. He does so many good thing so quietly that when you look at the box score you will be shocked. That’s why we call him “No Chrome.” He does so much without out needing his chrome polished.